Bright light gold color. Lively, toasty, fruity aromas of panettone and candied yams and mango with a bright, effervescent, fruity sweet medium body and a warming, complex, medium-long banana bread pudding, toasted pretzel bread, and sweet and peppery spices finish. A delightful and engaging spicy malty golden ale. Bottom Line: A delightful and engaging spicy malty golden ale. 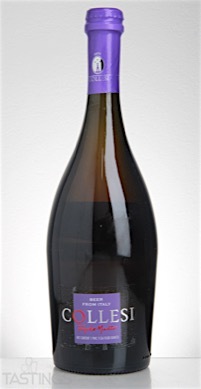 Fabbrica della Birra Tenute Collesi Srl Collesi "Triplo Malto" rating was calculated by tastings.com to be 93 points out of 100 on 3/14/2016. Please note that MSRP may have changed since the date of our review.